I had not intended to include a Camp Bomazeen history on this site until I received an e-mail which contained the information in the first block below which came from George F. Terry III. There was once a "Bomazeen Old-Timers" page on the Kennebec Valley District webpage, but this has since disappeared. 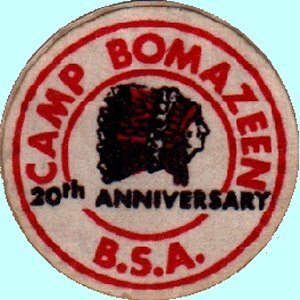 I welcome input from other "Bomazeen Old-Timers" who have memories of Camp Bomazeen that they would like to share. 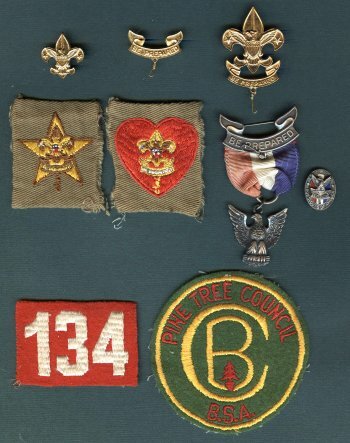 I was awarded Eagle Scout in 1940-43 while a member of Troop 136, Waterville. I was the first Scout to arrive at Camp Bomazeen when it became a summer camp with Charles Noyes as director. I later became the waterfront director for one season succeeding Malcolm Williams, who was the first waterfront director. I helped install the sanitary septic for the dining hall which had been Alexander's dance pavillion before Dr. George Averill gave the property to the Boy Scouts. The beach is also the place that I learned to swim at an early age. I helped build the swim dock (F) shaped and the tent platforms for the staff and troop campsites. I also attended one session at Camp Hinds. As I probably stated I am 81 and have always lived in Waterville. I knew Dr. George Averill as a neighbor and next door neighbor to my grandparents. He & Mrs. Averill lived in the same house all the years that I knew them. They were charming and handsome. Dr. George never worked as long as I knew them because Mrs. Averill was of the Keyes Fibre (Chinet) family and reputed to be millionaires. They quietly did much for the Boy Scouts, YMCA, Boys Club & Goodwill. My memory is that they purchased land and gave it to worthy organizations ---Alexander's Beach, North Belgrade to the Boy Scouts (Pine Tree Council). I was born in 1929 so became eligible for Scouting in Oct. 1941 (required age 12, no Cubs then). 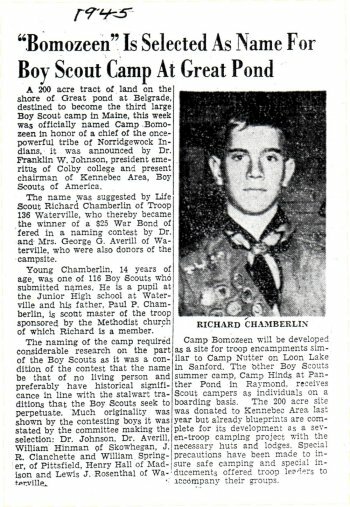 I went to Camp Hinds for 2 weeks in 1942 then as first camper at Bomazeen in 1943 which I believe was the first year of operation (I hope I am correct). I had known the beach from earlier because it was a popular place to swim for those families lucky enough to have a car during the depression. I remember very well because we lived next door to such a family thus had a car to share. When we first arrived there was a beautiful beach, a sizable building that had been a dance hall & eating facility (speakeasy during prohibition) and a couple of small sheds. The first job was to replace the septic system and put a water line to the building which was a combination rec/dining hall. Plumbing was outhouses. The sleeping was in tents in troop areas on platforms we built for troops who had their own leaders. As I recall I was a camper/staff so worked for board and room the first year, second year Asst. Waterfront, and the third year as Waterfront Director. I had misrepresented my age as 16 so had been admitted to Red Cross Aquatics school to get the required designation for the job. I also learned to drive an old dump truck that J. R. Chinchette Co. gave us. I got my license on Oct. 6, my birthday. My family had purchased a camp on Messalonskee Lake which is part of the same chain as Great Pond (Bomazeen location). Briefly rendered are my recollections. 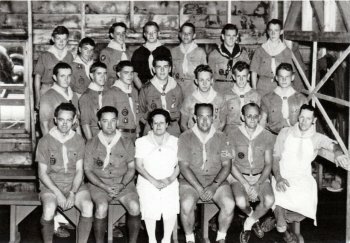 There are a number of men still around who attended as campers or staff. I'll try to get some names as I go along and run into these people. One is Keith Curtis, who became Eagle at the same time I did and lives in Waterville. I recall that many of us learned a great deal at a younger age because so many men were away during WWII. I remember a lot my age and then older age. Did not realize until entry into high school age. Those of us my age grew up with a great number of men who had returned from service. I am surprised when I sit down to think about how much went on & how we experienced and learned before this technical age. Enough rambling! Thank you for your patience. I have dug out my memory box and find that I was Waterfront director in 1946. My dates are a little off. My apologies. I found a Bomazeen neckerchief dated 1946, my merit badge sash and rank pins and patches. Eagle pin and several other items. Are you interested in having these or do you know someone who might. These are not things that my family would keep. My son was a scout briefly but did not continue. He was born in 1954 so that generation was not strong on this type of thing. He became a lawyer and father but was killed riding a bicycle in 1987. My daughter's son is in business but not married and will not have children in my lifetime. I would like to see such items in the hands of someone has an interest. Those items are now displayed near the bottom of this page. I have read the accounts of the earlydays of Camp Bomazeen written by my boyhood friend Tim Terry. I became a scout at age 12 in 1942. Like many of the first campers at Bomazeen I attended Camp Hinds as my first scout camp. I grew up inWaterville and, like Tim, was a member of Troop136. 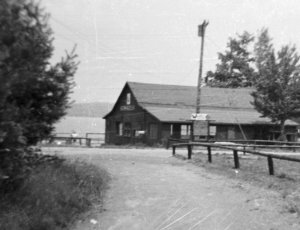 In 1945 there was a contest to name the new camp on Great Pond. I went to the Waterville library and found the story of Chief Bomazeen. I entered the name and was fortunate to have my entry selected as the winner. The prize was a $25.00 war bond. I was on the original staff and was the camp bugler. The land looked a lot different then with far fewer trees on the hill beyond the main hall..we called it Windy Hill. I was at the camp when V J day occurred. We rang the fire bell and the loaded onto trucks to participate in the Victory parade in Waterville. I was tapped for The Order Of The Arrow at Bomazeen and did my task by working on the access road which was in terrible shape. Three years ago my wife and I took a bus trip commemorating Benedict Arnolds epic trip through Maine. The tour included having lunch at the Norridgewock Historical Society's building. Among the indian artifacts there are papers which include Chief Bomazeen's signature sign. I double checked the scrap book my mother kept about my activities. The newspaper article describing the winning of the naming content was dated 1945. V-J day was in August 1945. 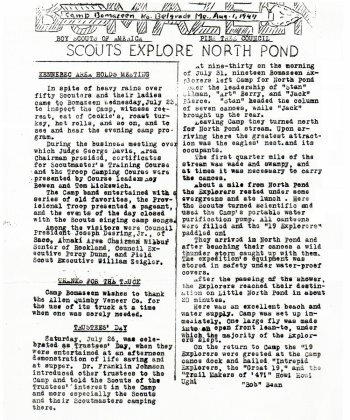 I have a copy of the camp newspaper dated August 1947 describing a canoe trip we took from Bomazeen up to little North Pond. I also a have a picture of the camp staff. Richard also provided some items of interest. Those items are now displayed near the bottom of this page. It is unclear when Camp Bomazeen first opened. George F. Terry III suggests it was 1943. Richard Chamberlin suggests 1945 as do the three anniversay patches below. 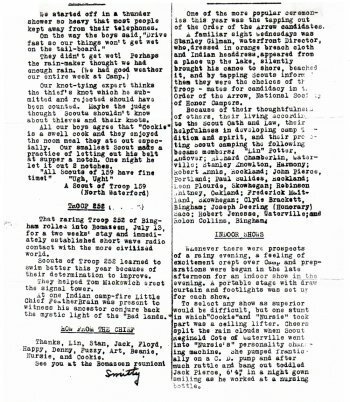 The Pine Tree Council literature states 1946. "The Camp Bomazeen property was donated in 1944 by Dr. George G. & Francis M. Averill of Waterville. The camp located on Great Pond in North Belgrade, Maine, was opened in 1946. Summer Camp operations ceased after the 2003 summer season. 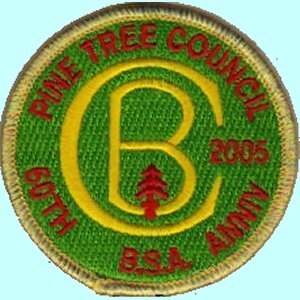 Pine Tree Council is currently in a fund raising campaign to convert Camp Bomazeen into a Cub World-theme camp. 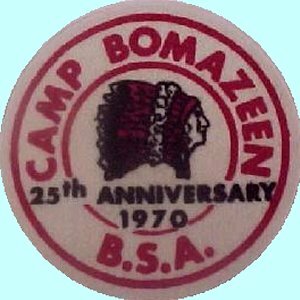 Camp Bomazeen is named for Chief Bomazeen of the Norridgewock tribe of the Abnaki nation." 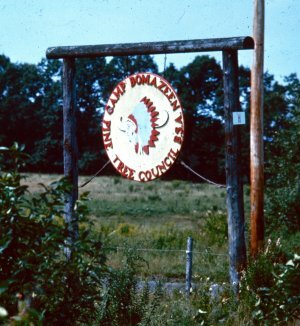 During the Prince Phillip Wars, there was a renegade Indian Chief by the name of Bomazeen, whose tribe inhabited the Norridgewock Valley. Bomazeen was hated by the English soldiers as he believed in the free way. The English decided that the only way to get rid of Bomazeen was to kill him. In December they set off with four officers and three hundred men along with four Mohawk scouts. They proceeded up the Kennebec River as far as Ticonnet, now known as Richmond. They camped here for a month due to a storm. Leaving a hundred and two men to guard the seventeen whaleboats, the rest set out in search of the famous Indian chieftain. After two weeks they came upon a brave, squaw and maiden. Automatically they opened fire, killing the maiden and capturing the squaw. The Brave escaped to warn his tribe. After running a long distance they caught up to him at the fording place of the river and opened fire, killing the brave. The squaw then called out "Bomazeen!" The English now knew that they had slain the mighty chieftain and went on to massacre the Indian's village. The fording place in the river is now known as "Bomazeen's Rips." Although Bomazeen was killed, the legend of the mighty chieftain lived on in his own people and is remembered by all Scouts and Order of the Arrow members. The above story has been told in this form at least since 1969. It is not known who wrote this particular version; it dates to the time when John O'Connor was our Lodge Chief and an active staff member at Camp Bomazeen. memorabilia which is dislayed here.